How you start your morning will pretty much set the tone for the rest of the day. If you bump your toe against the door on your way in to the bathroom, you’re almost guaranteed a few other things going wrong until about Midday. Hands up who’s been there? It’s like the entire world is against us on days like these. As much as accidental bumping into walls and doors isn’t always avoidable whilst we’re half asleep, there are a few things that we are able to control in the morning, and these are vital. This has been the most difficult thing to come to grips with. Not that I’ve ever been considered as the most selfless person in the world and I’m definitely not. We’re all a bit selfish in various ways, but this wasn’t about being selfish. This was about caring for my wellbeing, how I felt, what my body needs and what choices I decide make for me only. 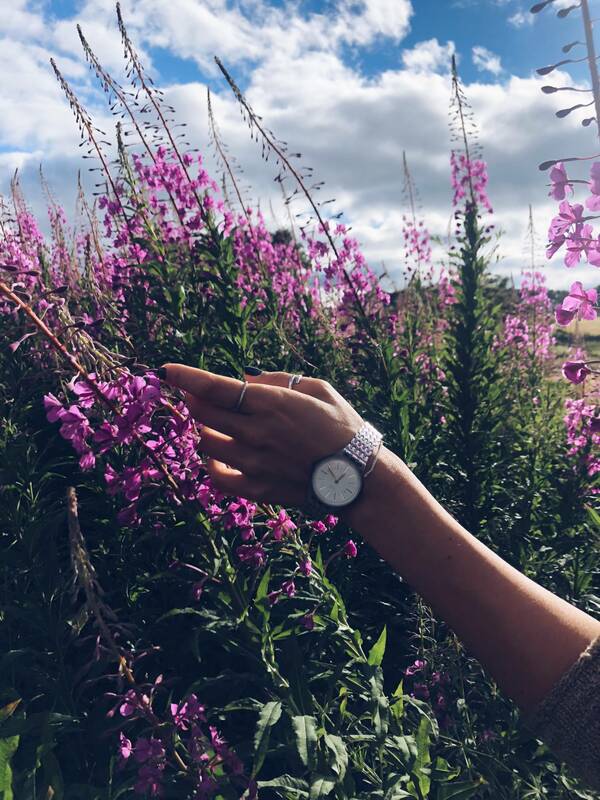 I’m a mum and although my daughter is almost a teen and very independent, I still feel guilty about proper “me time”. Mornings have always been about me being a mum first and everything else after. It is rewarding of course, but without some sort of self-love from the moment you wake up I found I lost control of things I eat, do or not do. 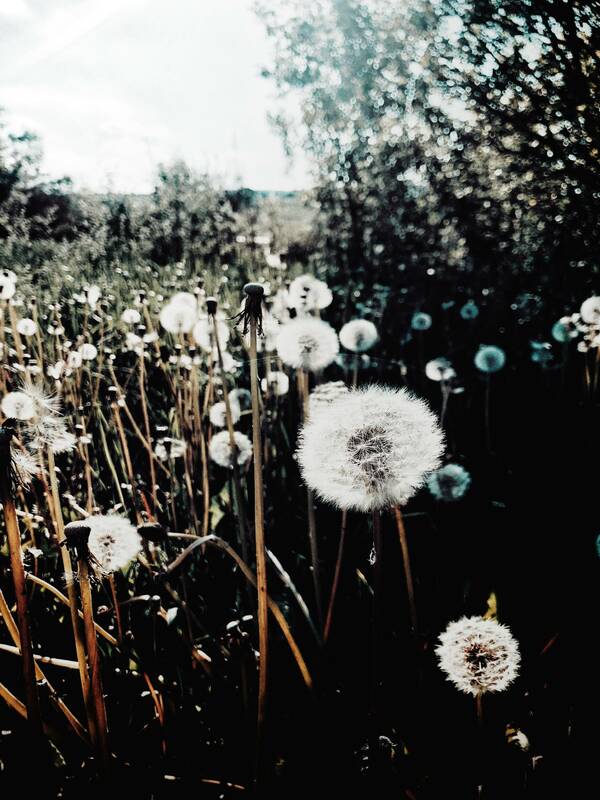 Setting intentions for the day ahead is still something I’m learning to do, but every night before going to bed I intend to wake up and do a bunch of small things or habits that will set me up for a lovely day ahead. Granted, I still get woken up by our dog Cooper sometimes and my morning begins by taking him outside first, but a blast of fresh air first thing never harmed anyone. If you use an alarm clock on your phone, try downloading something a bit more enjoyable to wake up to. 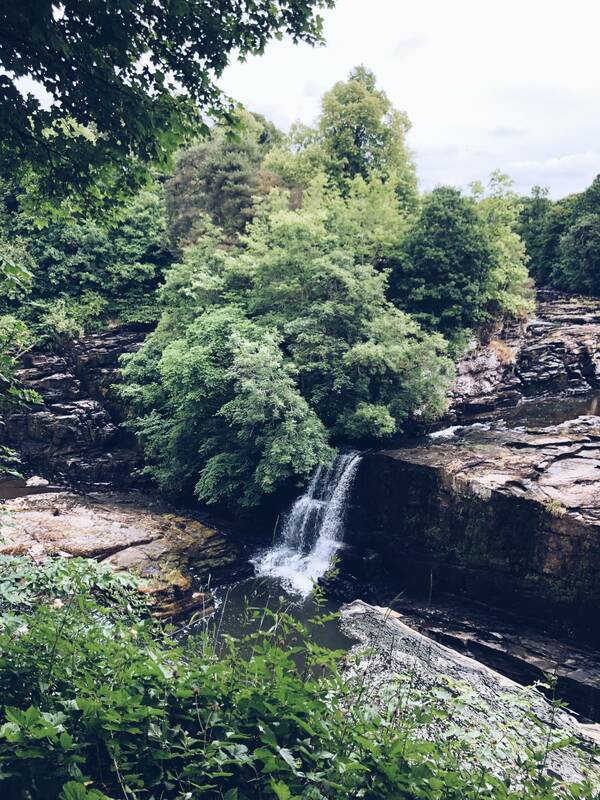 Sounds of nature, birds or even your favourite song is so much more enjoyable than an aggressive piano riff, though if that’s your thing – stick with that. Even it’s just a quick 2 minute stretch as you roll out of the bed, I do it anyway. On days that Sasha sleeps till 11am (she loves Summer holidays), I go out for a long dog walk with a couple of uphill sprints if I feel like it. When Sasha needs to be taken to school I stick to a 5 minute stretch as soon as I wake up and go for walks later in the day. There’s just something so beautiful about connecting with your body first thing in the morning. Feeling where some tension might be, giving it some “love” and simply appreciating your body. This helps me listen to it more. Some days I just know I need to have my feet up by 6pm and other days I push myself a bit harder. It’s a very obvious but often ignored connection we all must have with our physical self. Don’t lose it. No matter how much I want a buttery croissant, cheesy toast or homemade fluffy pancakes, I try and start my mornings with a nutritious breakfast. Not every single day because we all need some fluffy pancakes in our lives, but on weekdays it’s all about nutrition before noon. I’d say having a healthy breakfast is even more important than morning exercise if you can’t do both. Especially if you’ve had a terrible sleep as it’s when you’re craving sugar and carbs most. Be strong and just make it all about the right start to the day and the rest will flow beautifully. If you follow me on Instagram Stories you’ll know I like my smoothies in the mornings. They’re delicious, quick and I can seriously pack in as many nutrients into them as I want / can. Some mornings I’ll focus on iron, good fats and protein and others I might feel I need more vitamin c, calcium and fibre. Usually it’s whatever I have in the fridge and the fruit bowl, but I also like to have a few basic vital ingredients to add to smoothies as well. Things like almond and palm-free peanut butter, coconut or almond milk, seeds, frozen berries (which I use instead of ice), frozen bananas (these make everything extra creamy and smooth) and dates for smoothies with not much fruit. I also add a scoop of protein powder / shake to all my smoothies for that extra protein, nutrients and tasty flavour. 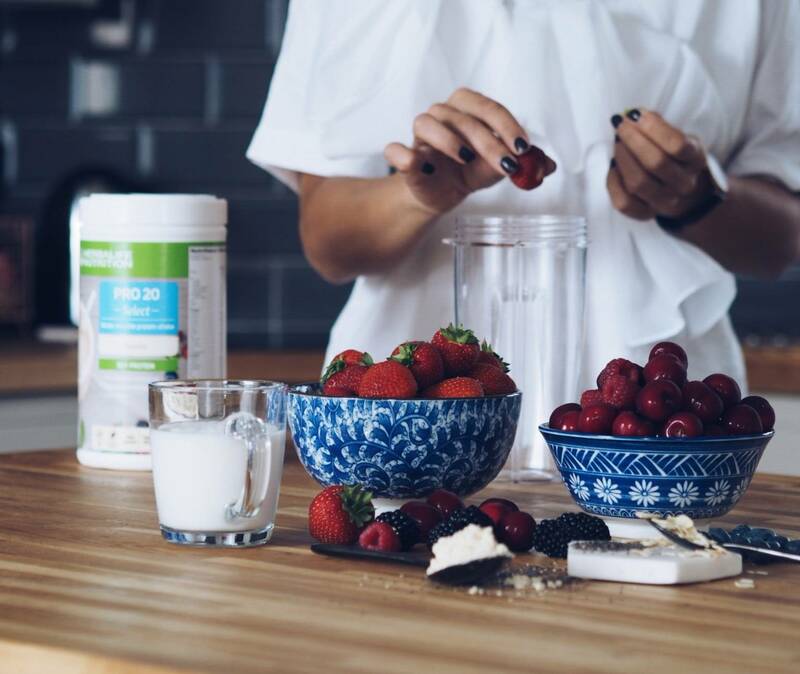 I’m so excited to partner up with Herbalife Nutrition for this post. I’ve been trialing some of their products for a few weeks now and so far love them. 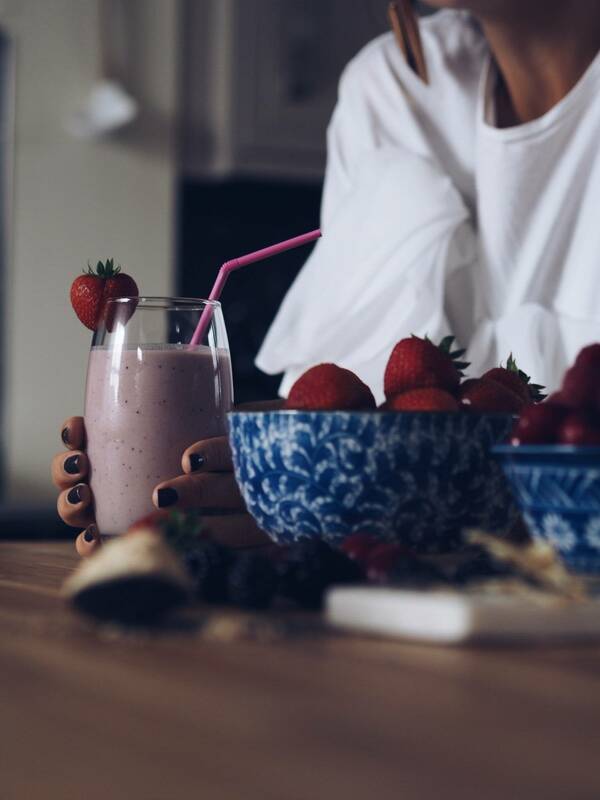 Although their Formula 1 shakes can be used as meal replacements for weight control, I like to use them in my smoothies to add even more nutrition to my already vitamin-packed breakfast concoctions. 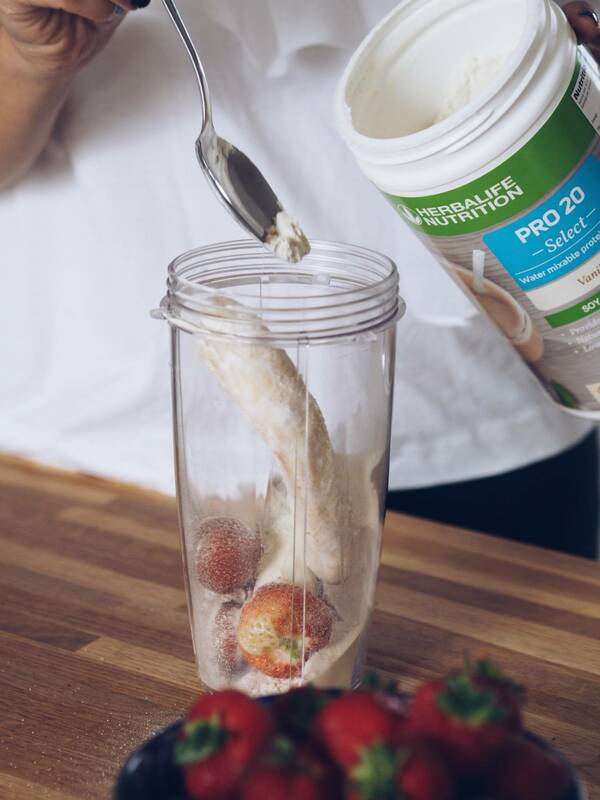 Herbalife PRO 20 is a new water mixable protein shake and a delicious way to refuel if you’re always on the go. I like to use Herbalife PRO 20 after my workouts. Although the product is water mixable, I still added the powder to my smoothies. PRO 20 is low on sugar, high on protein and is especially great for those on low carb diets as high content of protein aids muscle mass growth and maintenance. The Vanilla flavour is delicious and works ideal in any smoothie. It’s vegetarian, gluten-free and dairy free – ideal if you’re on a more plant-based diet too. 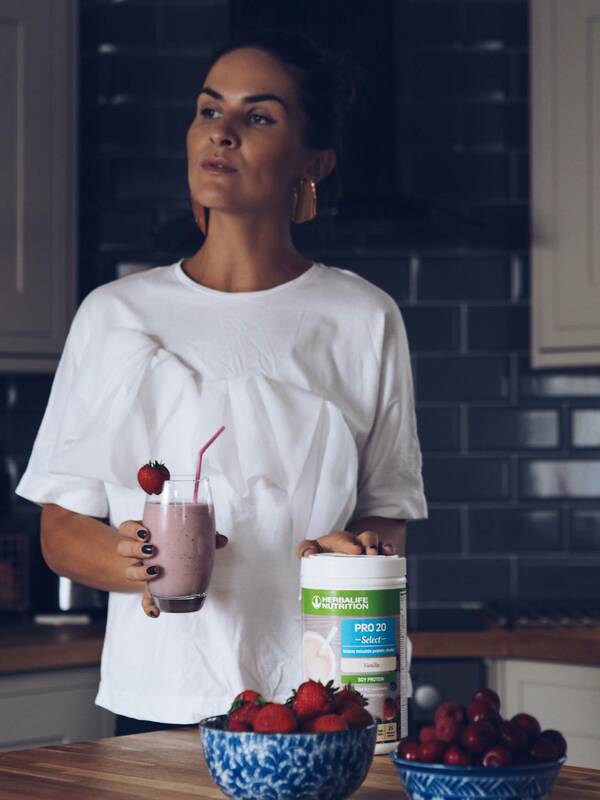 OK, lets not delay any longer and get straight to my favourite and easiest breakfast smoothie recipe packed with protein, potassium, fibre, calcium and much more. 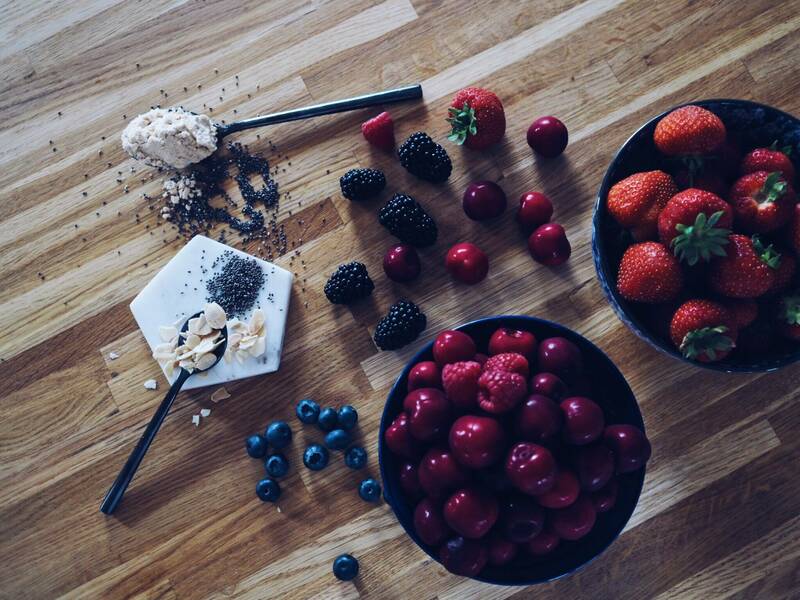 And that’s it – blend it all together until smooth and enjoy! So tasty and full of nutrients too. When I start my mornings with a nutritious smoothie I tend to make better, more mindful choices about my food throughout the rest of the day. Sure, a treat here and there, but nothing too crazy. Plus, I’m fuller for longer which means I can focus on doing all the productive stuff until then. How do you start your mornings? Do you struggle to get out of bed? Are you a “ morning person”? What do you have for breakfast? 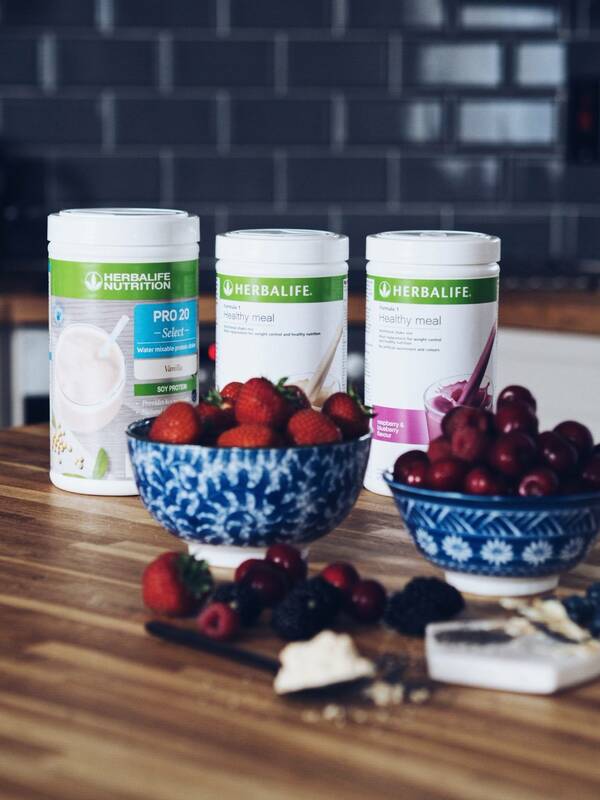 Huge thanks to Herbalife Nutrition for sponsoring this post. Early morning brisk walk, healthy breakfast and writing down some positive affirmations for the day! Love the recipe! I’m normally a morning person, but since my baby won’t sleep until 12 or 1am I’ve become a “get up early and be tired” or “just sleep til 12pm” person. But before I had her, I worked out every morning at 6am no matter how tired I was. It’s the best feeling and you get a sense of accomplishment! Those are all good habits! Wish my daughter was a teenager, lol. I am sooooooooo not a morning person! At all! I would rather sleep in everyday. But I have studied your post and will implement these great tips and see if it makes a change in my morning routine. I’ll even try the smoothie!! I’m definitely not a morning person either! I love how you’re able to overcome that and still have a balanced and healthy routine including me time! 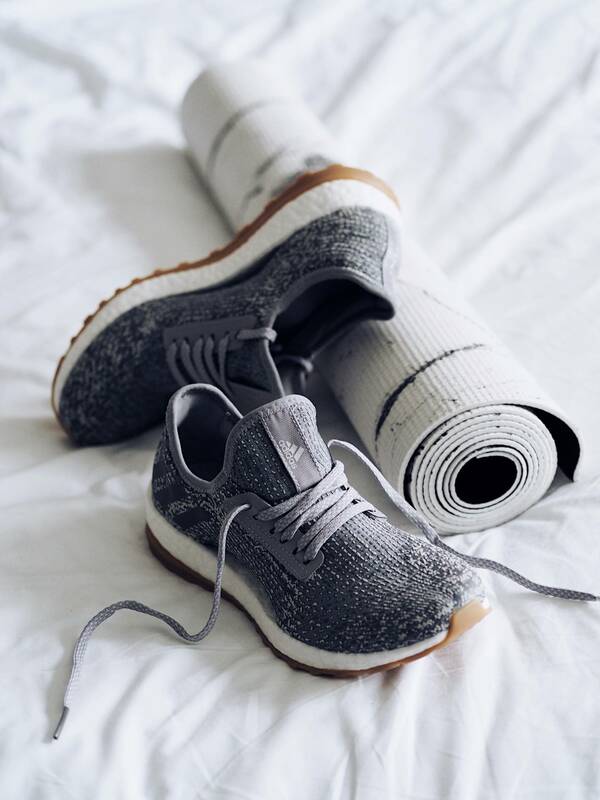 I am SO NOT a morning person at all so I will be needing this post and the inspiration to change my routine! Awesome tips. 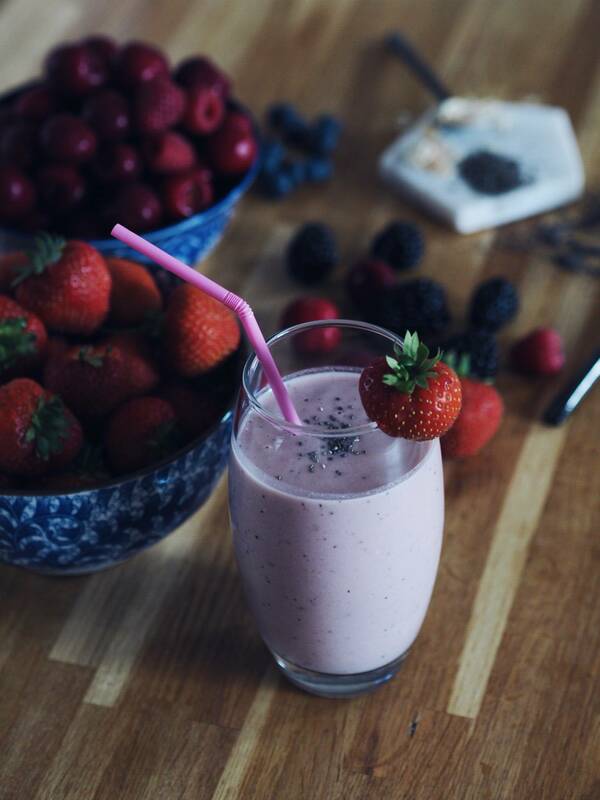 The smoothie looks so yummy! Sometimes I’m morning person 😉 and love to exercise some abs before takeing breakfast. So however I’m get up later only in the summer IIm take breakfast and after going out to run and swim. Don’t matter the temperature;) . My stressed mind need that. I’m used on the past Herbalife shakers for the mornings and shaked also with fruits. It’s better and yummier:). Sometimes I’m used before take a lunch or dinner for eat less. Good choice and keep motivated. 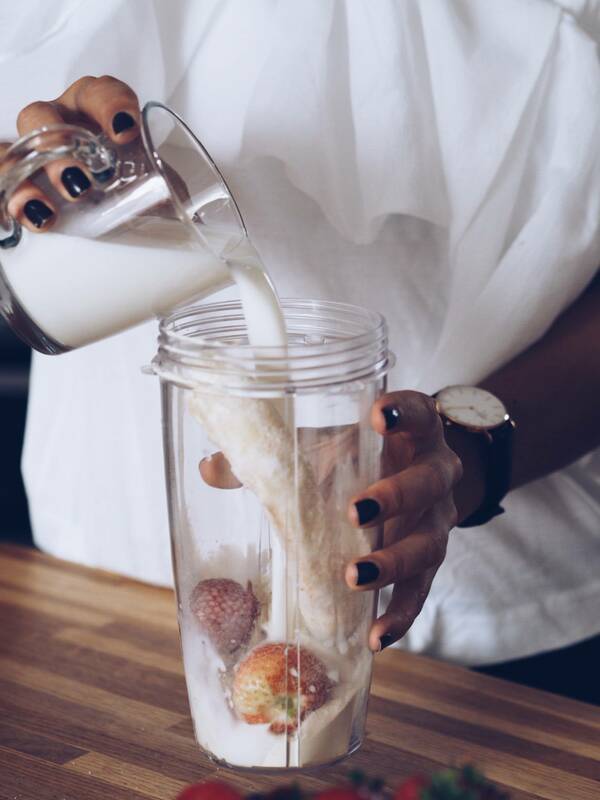 These smoothies look so delicious, I will definitely have to try this recipe. I am not always a morning person but I will start using these habits when the fall comes back around and kids are back in school so get back into the morning routine, thanks for sharing! Wow !! What an inspiring post! I absolutely am a morning person and feel it is the best and only time to get important work done! I definitely need to move more and make healthier eating choices! Must try the Herballife!!! I love my morning smoothies as well!! 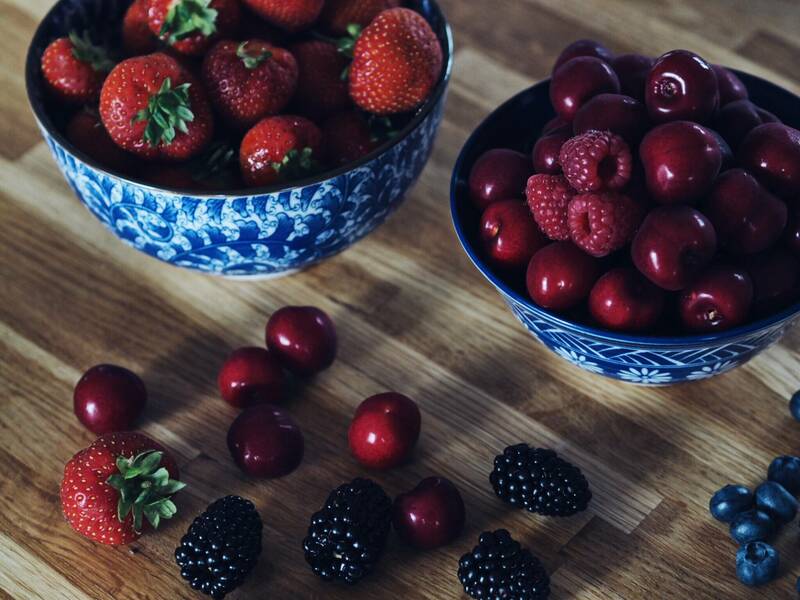 I feel like changing my breakfast to something with lots of fruits and veggies has really helped my mornings too 🙂 I really do need to start exercising in the morning instead of in the evening, but I’m still struggling in that area. Glad yo uwere able to make these changes in your routine! This is so true! I love everything you wrote here! focusing on ourselves and not to others is so important for our well being!